Hurray it’s almost Christmas!Christmas parties, eating, drinking and being merry, family and friends exchanging gifts, excitingly wrapped presents under the tree, everybody loves Christmas! Especially burglars! 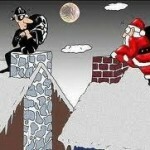 Christmas is the busiest time in the burglars Callander. These thieves are rubbing their hands together looking down your street for what new and exciting goodies they can steal. 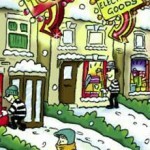 Figures from Halifax home insurance revealed a 25% rise in burglary claims last December compared to the festive period in 2010. The total number of claims in December last year reached 1382 with an average of nearly 50 claims made each day over the Christmas period according to Halifax. So what can we do to help prevent this from happening? First of all you need to look at your general home security. The Metropolitan police revealed that most of these burglars are essentially opportunist homing in on the weakest link in a property”s security and statistics from the met confirm that over half of burglars gain access to a property from the back, therefore it is vital that the back entrance is just as secure as the front of your property. Have you got sufficient lighting in your back garden or at the side of your property? Have you got strong secure doors with adequate locks, up to the British standard? We can help you and do a free security check to confirm this. The next thing we need to look at is when it is more likely for a burglar to break into a property. Would it be when all your presents are hidden away from your friend’s, family and loved ones? Or would it be after you’ve opened them all up, left them around the tree and put the nice glossy boxes from the presents out for the rubbish? This is literally window-shopping for the burglar. There he is, walking down your road. So not only do we have to make sure that our home security is up to scratch but also when we are throwing out all the rubbish boxes from Christmas make sure you put them in a black bags and put them out for the rubbish the morning the bin-men come to collect it. Don’t give the burglar’s time to rummage through and find what goodies Santa left you!No property, outhouse or shed is immune from the threat of a burglary, however making it more difficult for a would-be burglar, can prevent a joyful time being spoilt. Security awareness is just as crucial as high specification locks, so for more advice on other matters relating to your home security, please visit our blog page where there are a number of other useful blogs and information.